I've been using GRS engraving products since 1989 when I purchased a used GraverMax. Today my tool of choice is the GRS GraverMach. Simply put, this is the most advanced engraving system in the world. Its stroke speeds range from 400 to 8000 strokes per minute, and it affords the user the ultimate in fine control. The GraverMach can reduce the engraving learning curve by 90% over hand-push methods, making it possible anyone to cut designs after a short time of practice. 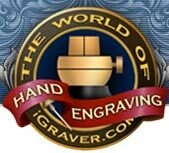 This machine is perfect for nearly every type of hand engraving, including bulino or banknote engraving, relief engraving, sculpting, jewelry engraving, diamond setting, and even scrimshaw and wax carving. Want the look of hammer & chisel engraving? No problem, just turn the stroke speeds way down and you can achieve the characteristic chisel steps of hammer work. This is important for restoration projects. The original GraverMax is still a good machine and there are thousands of them in use around the world. The difference between the GraverMax and GraverMach is similar to a car made 20 years ago versus one made today. Today's models are faster, quieter, smoother, more efficient, and have improved control. The GraverMach is absolutely quiet and vibration free. In fact, were it not for the indicator light, I would not be able to tell that the unit is turned on. In addition to its precision air regulator and host of other enhancements, the throttle bias control is the best feature on the unit. After adjusting the air pressure for the handpiece you're working with, the bias control futher fine-tunes the machine for flawless accelleration. To me, this control alone makes the machine worth buying. For me, this is truly a dream machine that I can count on to deliver the precision performance and control that I require. The GRS 901 is my workhorse handpiece. I use this handpiece for probably 90% of my work. It has a broad power range and can do everything from light shading to heavy relief engraving or stone setting. The QuickChange tool holders make changing gravers very fast. After the bulk of my design is cut with the 901 handpiece above, I switch to the Monarch to complete the fine detail and shading. This little handpiece is a real performer when it comes to fine work, as it's very controlable and enables me to cut the finest lines imaginable. Even with its small size, the Monarch is quite capable of outlining scrollwork and doing tasks that the 901 does. I know engravers who use this handpiece almost exclusively. People with small hands really enjoy its comfortable size. This is the Magnum handpiece....the big kahuna. When the ultimate power is needed, this puppy will hog metal like nobody's business. I don't use it as often as the Monarch and 901, but when I need power, this handpiece delivers PLENTY. It comes with two knobs, the traditional mushroom knob and and oblong egg-shaped knob which is perferred by some engravers. Like the Monarch and 901, the QuickChange feature makes changing gravers fast and easy. I primarily use the Magnum for deep sculpting and carving, western brightcutting, and for rapid and deep metal removal in large areas. Don't let its power fool you, though. It can also cut fine work quite well. BOTTOM LINE: If I could only have one handpiece I would choose the 901. If I could have two, then the 901 and Monarch can deliver everything I need for 95% of my work. With the addition of the Magnum, the engraver is equipped to do any engraving task. In my tutorial on relief engraving I mention that the bulk of my background removal is done with a rotary handpiece. 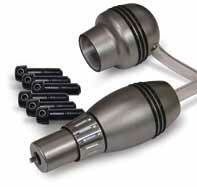 This is the GRS 850 Turbo handpiece, and is the finest air turbine handpiece made. It's manufactured it Japan and operates at a blazing 400,000 RPM. If time is money (and it is), this tool can really expedite the removal of backgrounds. It uses 1/16" (1.6mm) dental burs, and attaches to the auxillary port on the front of the GraverMach or GraverMax system. Great for all metals except platinum. I can't live without it. *This is a rotary handpiece, not an engraving impact handpiece like the ones listed above. 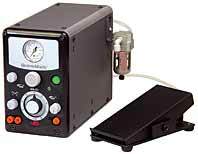 Made in Japan by the NSK company, the Electer Emax is the best micromotor made. If you're a jeweler who uses a flex shaft, this unit will do the same tasks and more with greater precision and flexibilty. Its extremely high torque at slow speeds sets it apart from the rest. When equipped with a speed reducer, it's the perfect tool for preparing stone seats in diamond setting. Unlike a flex shaft, it is highly maneuverable and doesn't have jerky performance. Since the Emax has a top speed of 35,000 RPM, it becomes a fantastic tool for background removal, especially in platinum, where the Turbo handpiece's extreme speed causes burs to dull quickly. 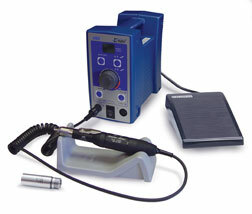 Its slower speeds allow me to carve and shape metal with great control, and holds all standard jewelers burs. It can also use 1.6mm dental burs with optional collet. This is an absolutely awesome tool. For years I suffered with noisy air compressors. I tried locating them to another part of my workshop and even put them in a different room and ran the air hose to my bench. While this helped, the other room was a large part of my workshop that wasn't air conditioned, and the build-up of moisture in the line was a constant problem as the warm air entered the cool room where I worked. To make a long story short, I purchased a Sil-Air silent air compressor and have never been happier. It will operate 2 GraverMachs without trouble, and is extremely quiet. About the only noise you hear is a click when it turns on. This is the perfect compressor for apartments or where noise is an issue. 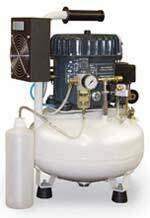 You can certainly use less expensive compressors if you can locate them to a place to minimize noise. If that's not possible, then the Sil-Air is the solution. I have no regrets with this compressor other than I wish I had purchased one sooner. Since I use a microscope for all of my work (and have been since 1982), I've found the GRS Low Profile Vise and Turntable Base to be the most effective method of keeping work centered under the microscope. It's very fast and offers more travel than their Positioning Vise. If you're new to engraving under a microscope, you quickly learn that an ordinary engraving vise is almost useless, since the area you're working on frequently orbits around the center of the vise's rotation. You then have to chase the work around with the microscope, and this leads to frustration and lost time. With the turntable base arrangement, the turntable is centered under the microscope with its centering post, then the vise's crown is locked so that as you turn the vise, the vise and turntable turn together. As you begin to work off center, simply scoot the vise around to position the area you're engraving directly under the microscope. Microscope engraving complicates things a bit. Don't attempt it without a proper positioning arrangement. 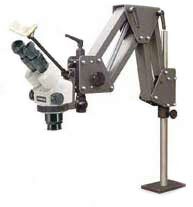 The Low Profile Vise with Turntable is the solution for microscope engraving. As I said before, I began using a microscope in 1982, and have used it for 100% of my engraving work since that time. The stereo microscope is an extremely important piece of equipment, and will enable you to do work that is far superior to work done without magnification or with a headset magnifier. This is not an exageration. Once you use a microscope for engraving you will never want to work without one again. Not only will your work be light years better, but you will not suffer from fatigue or eye strain when using a microscope. The reason is because when working without a scope or with headset magnifier, the muscles in the eyes must be constricted for close focusing. This causes fatigue, headache, and eye strain. When using a stereo microscope, the eyes are focused at infinity. You can work for hours in this relaxed state without fear of eye strain. I'm using the Meiji EMZ-5 stereo zoom microscope. When equipped with the GRS Acrobat stand, you have a bright, clear, image with approximately 5x to 20x zoom range. The Meiji scope is made in Japan, and is a very high quality microscope that has become the standard of the industry for hand engravers. I have also used Zeiss Stemi zoom scopes when teaching at the Alexandre School in Belgium. They are awesome microscopes and deliver the quality of image and brightness you expect from one of the world's greatest optics makers. The down side is that they are extremely expensive, and probably tripple the price of the Meiji system. CHINESE MICROSCOPES: I cannot caution you enough about Chinese microscopes. I have tested many, and nearly all failed miserably. I'm not saying there are no acceptable Chinese scopes because I've not seen all of them, but China has notorious quality control issues which varies from batch to batch. You may have one batch of perfect products followed by batches with shabby construction. The Chinese scopes I tested and continue to see for sale around the world at jewelry exhibitions are poorly made, and have dim, brownish views. To make matters worse, the majority of Chinese microscopes I've seen and tested do not remain in focus throughout the zoom range. Working with a system like this is maddening. When it comes to optics, you get what you pay for. Cheap camera lenses perform like cheap camera lenses, and such is the case with cheap microscopes. You will be spending thousands of hours looking through your microscope. Do yourself a favor and don't try to save a few hundred dollars by buying something cheap. A quality microscope is money well spent, and I promise that you'll never regret buying one. If you must consider a Chinese microscope, be sure you can return the unit if it's unsatisfactory. Test it for brightness and smooth zoom operation, and if the focus drifts when zooming, get your money back or exchange it for another one immediately. The above setup procedure adjust the scope so it remains in focus throughout the zoom range. This is extremely important for efficient use of a microscope.